Join us Sunday Evenings at 6 pm and learn how we can consistently be Winning the War Within! There is an intense battle that wages in hearts – the battle with sin. The conflict is real and challenging. The book of Romans clearly establishes the fact that believers have a position of righteousness through the blood of Christ. Yet our perfect standing in Christ does not always translate into perfect attitudes, thoughts and actions as we journey through life on this earth. The conflict with sin is real and challenging. Believers often feel as if sin cannot be conquered and that spiritual victory is elusive. Romans 6-8 gives us much needed gospel truth and hope. We are reminded of our position in Christ, the reality of our conflict with sin, and the solution that God provides. 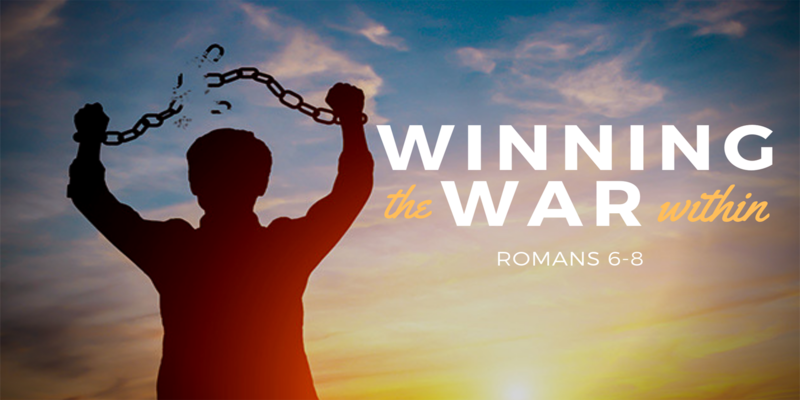 Join us on Sunday evenings at 6pm and learn how we can consistently be Winning the War Within!